I'm back tinkering with robots again but I haven't been updating my website. Instead I've documented my robots on LetsMakeRobots.com. At some point I hope to mirror the information here but in the mean time it's just my older robots/tinkering here. 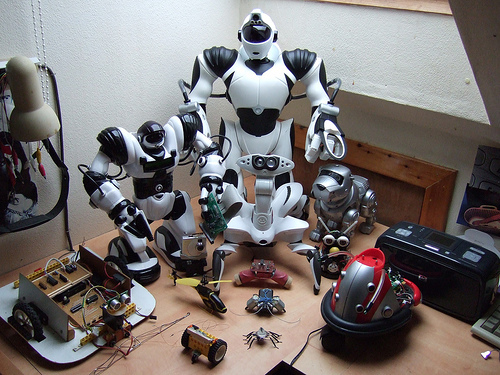 Starting back in 2000 I collected or built some robots, robotic toys and hacked similar toys. The page with some of my earlier experiments is now at background. Subsequent to those experiments came the Robosapien robotic toy, being the first to purchase a Robosapien from my local "Gadget Shop". I started by dissecting and documenting the robot and proceeded to add a PICmicro controller which developed into a Robosapien Alarm Clock project. Following the Robosapien I went back to basics, making xi the cross-eyed photovore and made some "spiderbots", pager motor activated vibrating bots. I was then bought a RobosapienV2 and Roboquad for Christmas 2007 but I have been much too busy to fully dissect or experiment on these new additions. My wife and I received an iRobot Roomba for a wedding present and I thought this would spur me back towards robotics but alas it did not. In 2011 I started work on an animatronic hand.